Installation of the huge monument on the roundabout outside Tamworth Railway Station marked the end of 18 months of consultation, designing, planning and back-breaking labour by artist Luke Perry. The six-metre tall steel figure was put in place during a meticulous operation on Sunday, May 20, involving a large crane, ropes and ladders. The result is an impressive, striking sculpture which will greet people as they step off the train and point them towards the town centre along Victoria Road. For sculptor and artist, Luke, it was the final stage in a long project which became a real labour of love. “It’s really nice to have the statue finished and safely in place,” Luke said. “Although we had practised putting her together off-site, you can never know how something will look on location and how it will fit into the street scene. I’m really pleased with the final effect as engineering wise this is rather advanced for a sculpture and I think it works really well. “I enjoy working in Tamworth so I will miss the team here; it’s probably the best team I have worked with in my career. They are all very innovative and forward-thinking in their approach to engaging people with the arts. While I’ll miss that, I won’t miss the hard labour! I’m still having physio now from the hours of work; but I wouldn’t have it any other way. 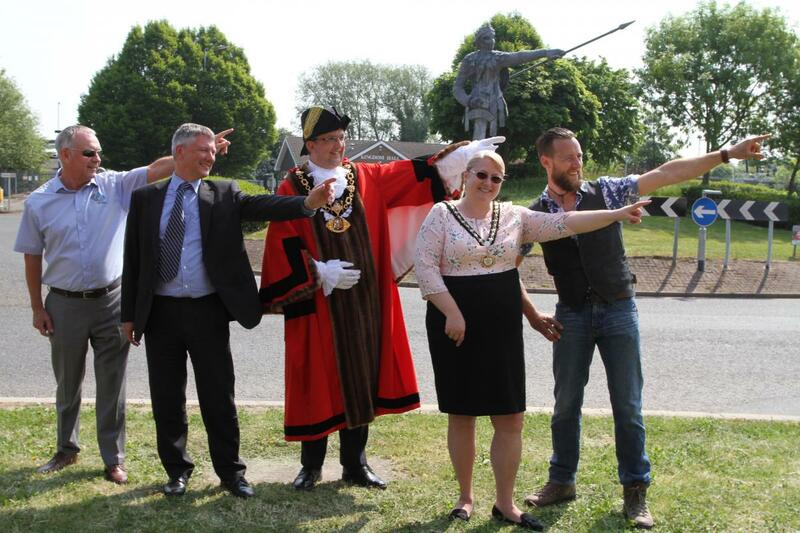 Unveiling the statue was one of the final duties performed by the outgoing Mayor of Tamworth, Cllr John Chesworth, before his term of office came to an end the next day. He said: “The unveiling of this statue of our Lady of the Mercians marks the end of a long project by many different partners, and the end result is really stunning. The creation of the sculpture brings together several projects and initiatives; to bring art into more areas of Tamworth, to improve the gateways into the town centre and to celebrate one of the most legendary and important figures in our Anglo-Saxon history. The ‘Roundabout Art’ project is one element of the Arts in Unusual Spaces initiative, funded by Arts Council England and developed by Tamworth’s Arts & Events team, which is seeing art in all its forms popping up in a variety of locations across the borough. The sculpture is funded by Arts Council England and Tamworth Gateways Project – a partnership between Staffordshire County Council and Tamworth Borough Council. Aethelflaed is a key figure from Tamworth’s past, having played a pivotal role in English history by building a chain of fortifications against Viking invaders throughout the Kingdom of Mercia. Her fortification of Tamworth in 913 AD became the forerunner to Tamworth Castle. Daughter of King Alfred the Great, Aethelflaed’s accession as a female ruler has been described as one of the most unique events in early medieval history. She was chosen as the subject for the new statue following consultations with local people, exploring what they are most proud of about Tamworth. Luke’s final design aimed to reflect the town’s Anglo-Saxon history, but with an ‘alternative, modern twist’ that places it firmly in the 21st century. It was a timely choice by Tamworth residents as 2018 represents the 1100th anniversary of Aethelflaed’s death in the town on June 12 and a number of events are being planned to mark the occasion. These include a national service of commemoration organised by Tamworth and District Civic Society, which is being attended by hundreds of VIPs, including Prince Edward, Earl of Wessex. To celebrate the homecoming of the statue, we’re asking people to join a social media campaign and #DotheAethel. Simply take a picture of yourself, or with your friends, replicating the pose of the impressive steel statue and share it on social media with the hashtag #DotheAethel. The hope is that the campaign will attract attention across Tamworth and beyond to raise awareness of this incredible female warrior and the part she played in the making of England. 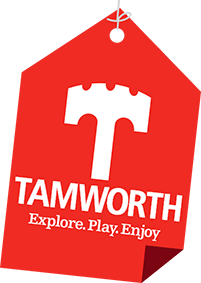 To join in, share your pictures with us on social media, tagging @VisitTamworth, using #DotheAethel and #Tamworth. For more information about the weekend of events and full instructions on how to #DotheAethel, please visit www.aethelflaed.co.uk. Watch 'Our Aethel's' installation video below.